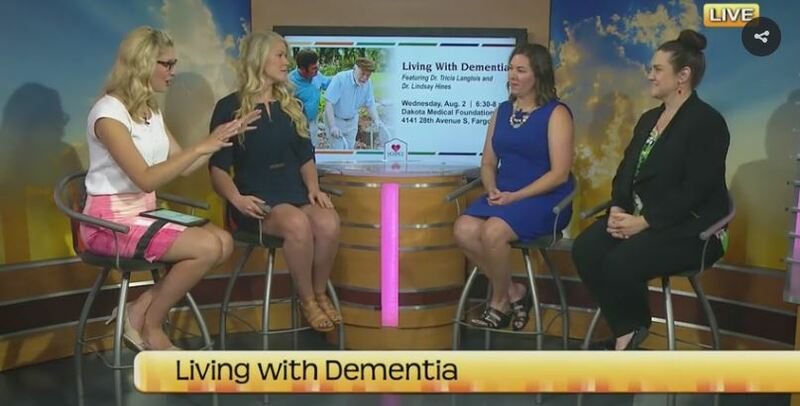 Sandra Buchholz, community relations specialist with Hospice of the Red River Valley, and Kendra Binger, program manager with the Alzheimer’s Association Minnesota-North Dakota appeared on the ND Today show to discuss the upcoming Living with Dementia event. The event will include practical advice, resources and stories to offer hope and guidance to those living with dementia and their caregivers. It will feature Dr. Tricia Langlois, medical director with Hospice of the Red River Valley, Dr. Lindsay Hines, neuropsychologist with Sanford Health, Kendra Binger, program manager with the Alzheimer’s Association Minnesota-North Dakota, and Beth Ustanko, co-founder of Memory Café. Bring your questions about living with dementia at any stage for our experts! Living with Dementia will be held Wednesday, Aug. 2 from 6:30-8 p.m. at Dakota Medical Foundation located at 4141 28th Ave. S. in Fargo. Family caregivers, professional caregivers (nurses, social workers, chaplains, clergy, physicians) and anyone who works with people suffering from dementia.